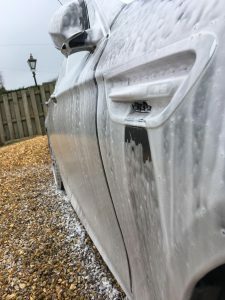 We also offer Standard Vehicle Valeting using the same careful techniques and fine products as in all of our detailing treatments. This service is suitable for previously valeted and vehicles in new or as new condition. Vehicle is fully hand washed in detail. Power vacuum of the interior. Windows are cleaned inside and out. All interior plastics are cleaned and dressed. Air freshener is applied. Wheels and tyres are cleaned and dressed. Vehicle is fully hand washed in detail. Power vacuum of the interior. Windows are cleaned and polished inside and out using our citrus window cleaning polish. All interior plastics are cleaned and dressed. Air freshener is applied. Wheels and tyres are cleaned and dressed. Bodywork polished. Includes supreme valet PLUS, all carpets and material mats front and rear shampooed and deodorised,. Boot/luggage compartment carpets shampooed. Leather interior – fully cleaned and conditioned. All material seats shampooed and head lining shampooed, cleaned & deodorised. Exterior paint renovation for dull/faded paintwork. Scratches and marks removed where possible.